Almost two years ago — exactly a week before Anders Behring Breivik’s massacre in Norway — U.S. Secretary of State Hillary Clinton and Secretary General Ekmeleddin Ihsanoglu of the Organization of Islamic Cooperation (OIC) launched what they called the “Istanbul Process”. Their initiative was a joint project of the OIC and the USA, and was intended to bring Western nations (especially the USA) into compliance with UN Resolution 16/18, which aims to “[combat] intolerance, negative stereotyping and stigmatisation of, and discrimination, incitement to violence, and violence against persons based on religion and belief.” The eventual goal is that member states of the UN will be required to pass laws criminalizing such “stereotyping” and “discrimination” based on religious belief. I don’t have to tell you that the intended primary beneficiary of Resolution 16/18 is Islam, and that all the attempts to implement the resolution are being pushed by the OIC and its Muslim Brotherhood-influenced allies in the governments and NGOs of major Western nations. Mrs. Clinton is gone from the scene now, felled by the Benghazi scandal, but the Istanbul Process soldiers on without her. The European Union has to a large extent already complied with the demands of Resolution 16/18, and that’s why it was such a pleasant surprise to hear about the recent vote by the European Parliament. The European Parliament (EP) in Strasbourg passed two resolutions Thursday, each detailing a set of recommendations to protect the rights of journalists to speak and print freely. “The EU, as a community of values, should aspire to lead in ensuring the free word, whether blogged or spoken, and information, whether researched or photographed, are protected. Journalists and a free, pluralist media, are essential for democracies and checks on power. Freedom of speech and freedom after speech are at the core of open and free societies,” said Marietje Schaake (ALDE, NL), rapporteur for press and media freedom in the world. The EP is the directly elected parliament of the European Union. Both moves by the EP stand in contrast to the more restrictive policies endorsed by the United Nations (UN) and the Organization of Islamic Cooperation (OIC). The OIC has endorsed “blasphemy laws” — the same type of law denounced by the EP in today’s resolution. Although now blasphemy laws are often euphemistically referred to as laws protecting the “defamation of religion,” the concept remains the same — laws that punish non-incitement speech about religion. The UN has worked with the OIC to help codify this type of speech restriction as international law. Some have already opined that the European Parliament, although ideologically praiseworthy, lacks the will to implement these resolutions as law, which now only exist as recommendations. Whether or not resolutions 2081 and 2082 are eventually codified in any way, the EP’s actions remain significant in the face of UN and OIC pressure to promote a more restrictive international speech code. What’s going oh here? Just a few days after this resolution was passed, Secretary General Ihsanoglu said the “Istanbul Process must also be seen as a poster child of OIC-US-EU cooperation.” So what happened to the third leg of the 16/18 triad? Did the EU secede from the Istanbul Process? Or was this just a last toothless gesture of European defiance against an illiberal regime that will criminalize all thoughtcrimes concerning Islam? Events surrounding the Istanbul Process often seem to move in a mysterious synchrony with other relevant events. Sometimes its proponents seize on a serendipitous opportunity, as seems to be the case with the Breivik massacre — which occurred just a week after the launch of the Istanbul Process. Alternatively, certain eruptions of “Islamophobia” are carefully prepared in advance, at least partially, and then used as grist for the OIC’s mill at the right moment. An example of the latter is the notorious Mohammed movie, which was obviously pushed into the Arabic-language Internet just in time for the “Free the Blind Sheikh” demos in Cairo on September 11, 2012. Events in Benghazi put a spanner in the works of that project — there’s no telling how it would have turned out if Al Qaeda hadn’t departed from the prepared script in Libya. KUALA LUMPUR, June 18 (Bernama) — The Organisation of Islamic Cooperation (OIC) will host the third meeting of international experts on the implementation of the UN Human Rights Council resolution on combating intolerance and incitement to hatred on religious ground from June 19-21. The experts will discuss issues like ‘Speaking out against intolerance, including advocacy of religious hatred that constitutes incitement to discrimination, hostility or violence‘ and ‘Adopting measures to criminalise incitement to imminent violence based on religion or belief as stated under the UN Resolution, the OIC said in a statement. One other point for discussion is ‘Recognising that the open, constructive and respectful debate of ideas, as well as interfaith and intercultural dialogue at the local, national and international levels, can play a positive role in combating religious hatred, incitement and violence,’ it added. OIC secretary-general, Ekmeleddin Ihsanoglu, who will be attending the three-day meeting, said that developing a better understanding among the international community on the issues and devising a suitable plan was significant. The first meeting was held in Washington D.C. in December 2011 while the second one was held at Wilton Park in London a year later, the statement said. The UN HRC Resolution 16/18 is within the framework of the Istanbul Process launched by the OIC secretary-general and former US Secretary of State Hillary Clinton in July 2011. Here is the official OIC press release saying more or less the same thing. What is notable in these statements is the conflation of “incitement to imminent violence” with “intolerance, negative stereotyping and stigmatisation of, and discrimination… against persons based on religion and belief”. The stated intention of the OIC and Resolution 16/18 is to induce countries to “[adopt] measures to criminalise incitement to imminent violence based on religion or belief.” But incitement to imminent violence is already outlawed as a criminal act throughout the West. The motive here is to first designate the criticism of Islam as “advocacy of religious hatred that constitutes incitement to discrimination, hostility or violence” and then equate that with incitement to imminent violence, as if Islam-critics were exactly the same as people who stand on an overturned car and urge their fellow rioters to “kill whitey” (or “greenie” or “sambo” or whatever the hated group might be). Following this logic, through his exposure of Islamic doctrine, Dr. Bill Warner would become as culpable for Muslim violence as if he had shouted over a megaphone for believers to go out and slit infidel throats. In fact, he would be even more culpable, since Muslims — as has become obvious from the two-tier system of British “justice” — will never be held accountable for public calls to kill infidels. Thus, what is billed as a nice fluffy opportunity for “interfaith and intercultural dialogue” becomes a mandate for the legal suppression of all information about Islam except that which Muslims themselves choose to release. Michael Kozak, Acting Principal Deputy Assistant Secretary for Democracy, Human Rights and Labor, speaking at the United Nations Office in Geneva June 21 at an Istanbul Process meeting organized by the OIC.. I haven’t been able to find out much more about the American delegation. Combating discrimination and intolerance forms a most daunting challenge of our times. It constitutes a matter of vital concern at the OIC. Over the past decade, the debate over religious intolerance and its relationship with freedom of expression received greater attention in both the media and political discourse. Unfortunately, notwithstanding the exposure and recognition accorded to the core issue, divergences in approach prevented the enactment of effective and concrete remedial measures at the international level. It was in this context that, highly committed to the matter and determined to reach common ground, the OIC came up with an alternative approach reflected in the Resolution 16/18 on “Combating Intolerance, Negative Stereotyping and Stigmatization of, and Discrimination Incitement to Violence, and Violence against Persons Based on Religion and Belief”. The consensual passage of HRC resolution 16/18 in March 2011has been widely acknowledged as a positive development. It demonstrated OIC’s ability to forge consensus on the most sensitive of issues in contemporary international relations. The resolution codified the eight points identified in my address to the 15th Session of the Human Rights Council in September 2010. These points constitute areas of action at the national and the international levels. I am gratified that they could form the basis of consensus. It afforded the opportunity to focus on the real issues away from the politicization and polarization of a decade. We did not stop at mere passage of a resolution. The Istanbul Process initiated with Secretary of State Hillary Clinton and the EU High Representative for Foreign Affairs and Security Policy, Catherine Ashton to build further on the consensus building that went into resolution 16/18 must be carried forward. While the resolution forms a triumph of multilateralism, Istanbul Process must also be seen as a poster child of OIC-US-EU cooperation. Our meeting today is a part of this Process. I appreciate that this Process has come to be recognized as the way forward by all stakeholders. Its merit lies in acceptance as the least common denominator. This approach carries a lot of potential in terms of evolving an international consensus to deal with the matter while addressing genuine concerns of all parties. The real test, however, lies in implementation. The consensus would, otherwise, be fragile. The approach signified by the resolution 16/18 is not an end in itself. It is a means to an end. We need to build on it. The Second Session of the Meeting touches upon a most important element of Resolution 16/18. It is most significantly characterized by divergence of views on the adoption of measures to criminalize incitement to violence based on religion or belief. It needs to be appreciated that there is sufficient clarity, at least in terms of the existing international law, on how to address advocacy of national, racial or religious hatred that constitutes incitement to discrimination, hostility or violence. However, progress with regard to concerted international action to that end, has been marred by extensive politicization and polarization of the issue. Let me clearly reiterate that this is a matter of vital concern for OIC. The alternative approach signified by the resolution 16/18 was intended to move beyond the politicization and polarization with regard to content or title of the erstwhile resolution in addressing the real issues on a consensual basis. The increasing trend of Islamophobia is indeed ominous in a globalized world. There has been an alarming increase in intolerance and discrimination against Muslims. It must be appreciated that there is mounting public pressure on OIC Member States to take concrete action. Alarming increase in Islamophobic incidents like the Utoya massacre in Norway, the burning of Quran by the Florida Pastor and release the reprehensible trailer on You tube [sic]continue to hurt the religious sentiments of over 1.5 billion Muslims. The political leadership of OIC Member States has been calling for immediate remedial action. It was in this situation that OIC as a responsible International Organization constituted a panel of eminent lawyers and human rights practitioners to examine the issue from the international law perspective. The panel endorsed the 16/18 approach and the Istanbul Process as the avenues for engagement. It was agreed that there is no need to move towards an entirely new legal instrument. The provisions of existing instruments, including articles 19 and 20 of ICCPR, suffice in covering OIC’s concerns. It is the voids or gaps in interpretation, implementation and information that need to be plugged. There are differences that must be ironed out to develop a common understanding. Concerns of all parties must be understood and addressed in evolving a consensual solution. I believe according equal weight to the concerns on both sides could form a good point of departure. The Istanbul Process carries the necessary resilience in this regard. I am confident deliberations at this meeting will make an important contribution. Let us now focus on the word respectful. An open and constructive debate of ideas is indeed useful. It must be upheld as a matter of freedom of opinion and expression. It, however, transforms into a case of incitement to discrimination, hostility or violence when the freedom is abused to denigrate symbols and personalities sacred to one or the other religion. It needs to be understood as a matter of identity. It needs to be acknowledged that people in some parts of the world tend to identify themselves more with a particular religion than elsewhere. It is, therefore, essential to draw a line between free speech and hate speech — Hence the importance of interfaith and intercultural dialogue. OIC was the first to call for such a dialogue in 1998. We have seen that the dialogue has continued for a considerable time without much to show for result. What we need is a movement beyond event based calls towards a serious, structured and result oriented dialogue. Similarly, we could benefit from an integrated approach with regard to international efforts geared towards combating intolerance, discrimination and incitement to hatred. The Istanbul Process, I believe can serve as an avenue for such an integrated approach drawing on and lending a concrete shape to the understandings reached elsewhere. In a world faced with the menace of terrorism, incitement to hatred, discrimination, and violence, cannot and must not be ignored. We would, otherwise, be faced with the unaffordable risk of the agenda hijacked and set by radicals and non-state actors. We need to act to wrest the initiative away from the street to the table of meaningful and result oriented multilateral discourse. Events like this meeting are increasingly important. Our deliberations here must aim at squarely addressing interrelated issues with particular reference to the grey areas. We need to evolve approaches that can remove the gaps in interpretation, implementation or information on a consensual basis. I personally believe and propose that we may look into the prospect of developing soft law that could reflect the common understanding of international community on this important issue. It could be in the form of some principles, guidelines or a declaration. I would like to leave it for the collective wisdom and common understanding of the experts to enlighten us to that end. The Istanbul Process based on the shared objectives reflected in the consensual approach signified by the resolution 16/18 lends me with reason for optimism in this regard. It’s important to pay close attention to Prof. Ihsanoglu’s speeches, because sprinkled among the soporific boilerplate items are phrases and sentences that telegraph what he and the OIC (and the State Department) intend for us. When the Secretary General refers to “the debate over religious intolerance and its relationship with freedom of expression”, he obviously envisages only one outcome to such a debate, the same one that was proposed by Canadian imams in Ottawa several months ago: all such speech should be forbidden by law. Up until now, says the Secretary General, all we have done is talk. The time has come for action: “The real test, however, lies in implementation.” And just in case they have forgotten, he reminds his listeners of “the Utoya massacre in Norway” — the most telling example of the dreadful consequences that will inevitably follow if the world community doesn’t put its foot down and criminalize “religious intolerance”, i.e. criticism of Islam. Further examples are given: the “burning of Quran by the Florida Pastor”, Terry Jones, and the “reprehensible trailer on You tube” that was so perfectly placed to serve the OIC’s purposes. By “voids or gaps in interpretation, implementation and information”, he means that some countries have been lax in their passage of laws that allow for the arrest and prosecution of people who criticize Islam. Britain, Sweden, Finland, Switzerland, and Austria have obviously complied. But what about the United States? And Islamophobes in Canada have gotten pretty bold since Ezra Levant and Mark Steyn stared down the HRCs. From the OIC’s point of view, it’s time for North America to get on the ball! Prof. Ihsanoglu sees some types of discussion as valid instances of “freedom of opinion and expression”. But other speech clearly crosses the line and “transforms into a case of incitement to discrimination, hostility or violence when the freedom is abused to denigrate symbols and personalities sacred to one or the other religion”. We must “draw a line between free speech and hate speech”. Denigration, of course, is in the eye of the beholder. We already know what criterion determines the degree of denigration: whether or not Muslims are offended. This standard is already widely in use, formally and informally, throughout the West. Since Muslims are offended by so many things — pigs, dogs, cartoons, uncovered women, a lack of foot-washing basins, non-halal food, non-Muslims quoting the Koran or the hadith — it’s easy to see how much freedom of speech will be left to us once the Istanbul Process is fully realized. He acknowledges that there are “grey areas” that may make interpretation difficult, but sees a solution in “the prospect of developing soft law that could reflect the common understanding of international community on this important issue”. “Soft law”? What is that? Is that when people lose their jobs for speaking out against sharia in public? Is that when publishers decide not to publish certain books for fear that their editors will be killed and their offices burned down? Is that when soldiers are forbidden by their commanders to read certain books, attend certain events, or express certain opinions involving Islam? When they are trained to urinate away from Mecca? Is that when hotels and conference rooms mysteriously cancel bookings for Islam-critical events at the last minute? If so, the “soft laws” are already in place. But I’ll wager the OIC intends to harden them somewhat over the next few years. Referring once again to the synchronicity of events surrounding the OIC conclaves, look for something else to happen soon that can be co-opted to fit the agenda of the Istanbul Process. Maybe it has already happened. Maybe it was the resolution passed by the European Parliament, which will in some way be utilized by the OIC (probably with the help of the European Commission) to hasten the Istanbul Process in Europe. But keep your eyes open. Ekmeleddin Ihsanoglu and the OIC aren’t done with us yet. Update: Vlad Tepes thinks he has spotted one of the synchronous events accompanying the Geneva meeting: an explosive device left outside a Walsall mosque. 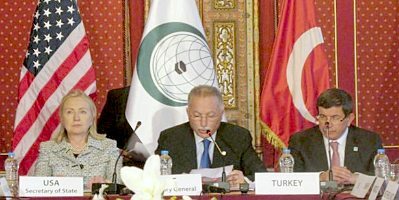 For more on the Organization of Islamic Cooperation, see the OIC Archives. This entry was posted in Canada, Civil Liberties, Counterjihad, Enrichment, Eurabia, Europe, News, OIC, PC/MC, Sharia, UK, USA by Baron Bodissey. Bookmark the permalink. Part of the Istanbul process is the sheer level of bumpf and b.s. they shovel at us. Khrushchev famously threatened to “bury” us. The OIC is carrying that out with their malign bureaucratic logorrhea. They have mastered the mental meltdown of conferences, meetings, and grandly named nothings. They are secure in the knowledge that no one will be paying attention – all busy watching TV – as they build huge monuments of paper which are designed to be impenetrable by the human mind. It’s no comfort to know our own Senate and Congress do exactly the same thing with their legislative “bills” full of booby traps for unsuspecting citizens. So does the EU, with its immoral “constitution” . Surely that mess is unconstitutional in a number of EU countries. No matter. The idea of ‘nations’ is soo 20th century. We need something robust and global. An ummah, maybe? I have a very simple idea on this: Congressman, Senators, and here in Austria, Nationalratsabgeordnete and Bundestagsabgeordnete, and elsewhere in any democracy have to WORK WITH THE PEOPLE AT LEAST TWO THIRDS OF THEIR WEEKLY WORKING TIME … there is enough time left to consider about really necessary legislature and the “daily business mass production of laws” comes quickls to an end. And its very obvious that its a foremost thing to change that cracy electoral system, where votes do not count similar …….. I have an idea for the President election, too. New President choosen by chance …… so EVERYONE can become President. And there is the possibility for re-election if people vote to more than 94 Percent for a next year … and this is procedure of re-election should not restricted until either the President wihses not to serve another year od simply because the 94 Percent are not reached. So the basic idea is: To have someone NOT OUT OF A PARTY “BUSINESS” but DIRECT FROM THE PEOPLE OF US CITIZENS ! Sure – US can become ashamed who is “within their borders” and is calling him Citizen, but more will be the effect that anyone – even a criminal will struggle to keep his or minds up to not harm anyone in his position and to work for the good. As the USA is facing the deep split done by governmental liars in TOTAL ABUSE OF THEIR FORCE and the pushing back of people`s wishes under the stress of lobbyists res-publica is vanishing and demon-cracy rising …… in government there are so bad asses, evil doers and betrayers …. its gigantic. Senators and Congressmen not only sitting and talking BUT LIVING AND WORKING WITH THE SOULS WHOSE SERVANTS THEY SHOULD BE IN A VIVID STATE would press those back into their core jobs FOR THE PEOPLE which are now so widely making wars against their own …… from whose money they receive their income by taxes ! Then “young America” was so successful because the Congressman and President WERE SOULS FROM THE PEOPLE FOR THE PEOPLE …….. this has been lost throughout the years by gigantic burocrat building and PartySystem buildings whith their imminent structure to evilness, which is segregation …..
Segregation is a habitus of the VPO (very proud ones) which do not even consider AN IDEA —– WHEN IT COMES FROM SOMEONE ELSE …….. and even worse; they FIGHT THE IDEA, when it comes from a member of the “enemy” Party —- even knowing its the best idea available at present. and the western press yawn and order another drink at the bar. What the oblivious West keeps failing to recognize and address is, that the “religion” of Islam itself, at its very core, is full of hatred, contempt, denigration and what not of anything and anyone outside of itself. Large swathes of the Quran are hate speech and open, unmasked incitement to violence and murder. Before pandering to any more of Muslims’ ridiculous demands, proper placement of this unholy book next to “Mein Kampf” and related stuff in the big rubbish bin of history has to enter public awareness and, ideally, pass our courts of law all the way up. It is sheer unbelievable that anyone still wastes oxygen on this idiocy. But they are also full of hate inside the fence – i.e., witness the Shi’a< ->Sunni fratricide, or when those two temporarily ally to kill off other, minor denominations within Islam. The Alawites and Kurds are persecuted by the Turks, and the Syrian mess is largely Alawite vs. all the rest. A murderous mess that the convenient fiction of an entity such as the “OIC” cannot dispel. It could happen so quickly that the “ground” of the “arguments” of the OIC is kicked away to an extent that they would understand within seconds that if they would prolong their course they themselves would harm their souls most ……….. if there is a keen and willing publisher. Where is he or she ? Dude. I patiently plough through your posts and to-date I have not found a single one that I can comprehend. I don’t know what to suggest but be assured NO publisher will even have a conversation with you until something, ANYTHING you write has a glimmer of comprehension. What is your FIRSTlanguage? All this talk about “hate speech” is, as we say in the USA, Baloney. If we were to look at many of the great works in the canon of our current political masters on the Left, we’d find lots of unvarnished hate and incitements to violence. I can think right off of the works of Marx, Mao, and Fanon. Sartre’s pretty bad, too. As an American, I feel disgraced by Shrillary Shrew and the whole Obama-ista crew. They could’ve told the world that they were sworn to uphold the rights of free speech and free exercise of religion (including some imam’s right to call Rahm Emmanuel the kinsman of apes and pigs), but instead chose to crumple before Islamic censorship. Pingback: Watcher’s Council Nominations – Out Of Gas Edition | Virginia Right!